Saturday was Distaff Day for the Peachtree Spinning Guild. They sweetly invited us to go, since my hubby went into the Antique Spinning Wheel group on Ravelry to purchase this for me. You might not be able to tell much difference, other than the lack of a Christmas tree behind her. 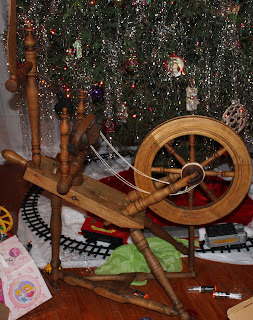 She's been oiled, cleaned a little more, and she's been spinning. She told both of us her name: Betty. Since she's from Eastern Europe, we decided to call her Bettina. She spins fast, but true, and she's light and easy to work with. As you can see, I've already been spinning on her. I bought about 8-10 ounces of Corriedale last year. You can't see the color really well for some reason, but it's a fuschia color. It's actually quite lovely. Now on to some projects. I forgot that while we were at the Distaff Day, Gale Evans from Gale's Art was there, with LOADS of fiber. She had a great deal on all natural alpaca, and I couldn't resist the lovely icy grey. Below that, is my attempt at the Fiddler's Mitts. I started these several months ago, and when I tried them on, they were too tight. So, I started them over. They are giving me tension issues: part of this one is tight, while the other part is loose. Like spinning, it's going to take some getting used to, so I'm going to take this one out, and let it sit for a while. Maybe I can work on it later. So, to the frog pond it goes. The last picture up there is Little Man's birthday sweater. He loves red (it's his favorite color, as he likes to remind us several times a day). It's a plain basic sweater and I think he'll get a lot of use out of it. As for the selfish knitting, Gemini is close to the increase rounds. We learned a lot at Distaff Day, and we were invited back for another guild meeting. It would be lovely to go, and we might in February. We're going to build a basic tool kit for it, and hubby is looking forward to adding to our collection. I still have to work on my simple skirt, and the kids' quilts. Sewing has been put on the back burner, as I have to clear the table and move the sewing machine back to the dining room table so I can use it. Now, if you'll excuse, Bettina would like some attention.